Workers in extreme temperatures wear Personal Air Conditioners (PACs) to minimize heat stress and fatigue. The PAC's improve comfort and productivity. PACs are available in two cooling capacities; 1500 BTUH and 2500 BTUH. All models can achieve temperature differentials of +/- 45 – 60 deg F from the inlet compressed air temperature using vortex tube technology. These models are adjustable by the worker using an integral temperature adjustment knob. The diffuse air vests are available in three sizes; large, xlarge and xxlarge which provides continuous cooled air through its perforated inner lining. The durable plasticized PVC vest allows full range of motion with no airflow restrictions; and does not absorb sweat or other contaminants. Body cooling vests can also be worn under other protective clothing. Workers in extreme temperatures wear Personal Air Conditioners (PACs) to minimize cold stress and fatigue. Another important use is to improve comfort and productivity. 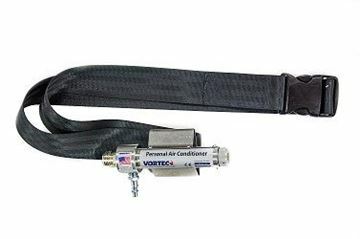 This PAC uses vortex tube technology to provide cold air relief and protection to workers in hot environments. This vest helps to minimize heat related injuries and allows the worker to be cool and productive while eliminating the need for costly, unproductive cooling breaks. Temperature adjustment knob provides easy temperature control, even with gloved hands. Available in two different cooling capacities;1500 - 2500 BTU/hr. The vest is made of an abrasion resistant, flame retardant vinyl laminated nylon that is self-extinguishing and has a melting point of 300°F. Workers in extreme temperatures wear Personal Air Conditioners (PACs) to minimize heat stress and fatigue. The PAC's improve comfort and productivity by using a cooling tube with belt that generates cold air to provide air flow to the worker. PACs are available in two cooling capacities; 1500 BTUH and 2500 BTUH. Both models can achieve temperature differentials of +/- 45 – 60 deg F from the inlet compressed air temperature using vortex tube technology. These models are adjustable by the worker using an integral temperature adjustment knob. 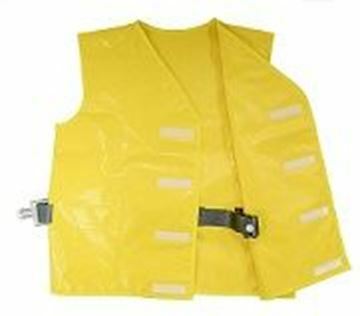 The vest is made of an abrasion resistant, flame retardant vinyl laminated nylon that is self-extinguishing and has a melting point of 300°F (149°C). The diffuse air vests are available in three sizes; large, xlarge and xxlarge. When used with the personal air conditioner, the cool air flows through the vests perforated inner lining. The durable plasticized PVC vest allows full range of motion with no airflow restrictions and does not absorb sweat or other contaminants. 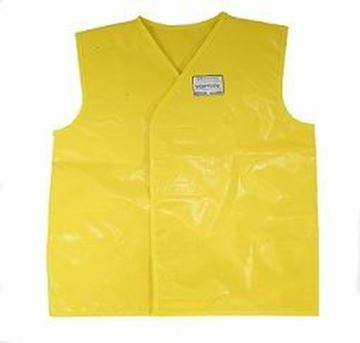 Body cooling vests can also be worn under other protective clothing.